When you are just beginning quilting most people pick an involved pattern that makes you even doubt that you can quilt. It looks very complicated but if you take it one step at a time it is very easy. You want to pick something that is useful and practical. Just donâ€™t pick anything to big or intricate. You never want to start out with a queen size quilt. My first project was a lap quilt and once I got started it just seemed to fall into place. When you first start out you need to finish some quick and easy project to build your confidence. The best thing to start with is a small lap quilt or baby quilt. I know the first pattern I picked out was just a little beyond my ability and the truth is that almost anyone can quilt if they start out small. Potholders are one of the easiest projects to start out with. Everyone can use a potholder and they are a quick and easy project. They can be as simple or as complicated as you like. They allow you to practice making your quilt sandwich. Just be sure to use an insulated batting like Insul-Bright. You can make them to match your kitchen dÃ©cor. Placemats I love to make these to match any occasion and also your dÃ©cor. You can use scraps or any design or color you like. They make great gifts and you can use colors that they like. You can also give them away to people like senior citizens. 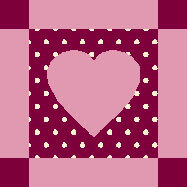 They love them and you also get the practice of quilting. Baby Quilts You can gain experience and also help a worth cause. I make baby quilts for a childrenâ€™s hospital in Portland. It gives you a good feeling to know that you are helping out people who are in need of baby quilts.